Gentle Techniques that Ease, Enhance, and Reset Physical Interconnections Deep Within the Equine Body by Jim Masterson. GET READY to discover subtle, gentle, simple bodywork that has the ability to profoundly affect the deepest interconnections of the horse’s body. The Beyond Horse Massage DVD, a companion to the book is a step by step visual guide, with each technique clearly filmed and explained in detail. Jim shows a complete treatment that covers the neck, shoulder and back. He has used this treatment to improve performance on over thousands of horses – and you can too! Enjoy demonstrations of the Masterson Method during this 80 minute DVD. 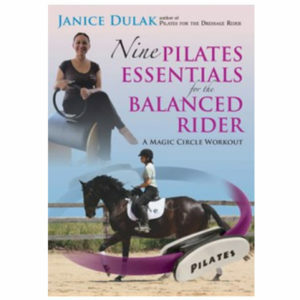 In this all new DVD, popular Pilates instructor and dressage rider Janice Dulak breaks down the body into nine essential “parts” that riders often are not even aware they have, let alone actively engage and use. And yet, these nine essentials are the key to “speaking” to your horse with sophistication and eloquence. By using the body like a dancer would, and by incorporating the “Magic Circle” exercise ring in a series of exercises, riders get a workout that targets and trains these specific and very important muscles and muscle groups in ways that will instantly apply to their riding. Eckart Meyners and Heike Kemmer will show you how amazingly simple it is to become a better rider. Eckart Meyners has developed special exercises to help the rider achieve better coordination and a more relaxed seat. The DVD offers solutions for typical riding problems, in addition to various warm up programmes for riders. Eckart Meyners trains riders for the German Equestrian Association as well as teaching all over the world. The Masterson Method is an innovative form of bodywork that relaxes the horseâ€™s body and relieves his muscles, connective tissue, and structure of deep stress and pain. Through the gentle and light manipulation of targeted Release Points; the movement of joints or junctions through a range of motion in a relaxed state; and studied observation of the horseâ€™s responses (his reactions tell you what he is feeling), youâ€™ll open doors to improved health and performance while enhancing communication and your relationship along the way.